So! You want to get started collecting, organizing, and sharing the information on the web into your own personal library for increased productivity, huh? Well, let's have some fun while we're at it. I know. "Call me Carnegie", right? Now that you have your own library, you should see a notification telling you to install the Firefox Add-on. Don't worry, it won't explode your computer or make ads swim around your screen (there are plenty of other apps if you're into that). All it will do is put the power of knowledge at your fingertips. Pretty cool, right? Who knows? Maybe you'll produce some "real and lasting good" of your own. 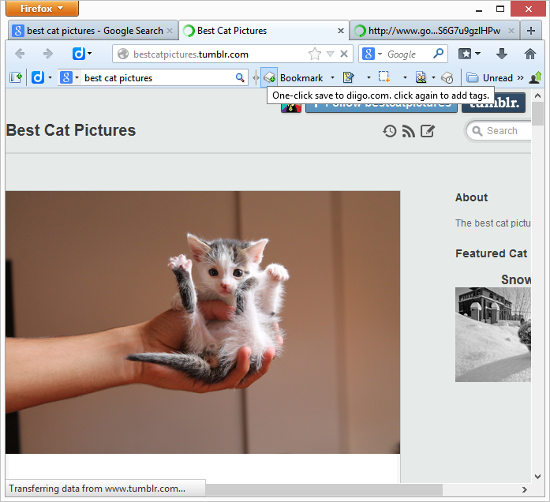 So you've installed the Diigo Firefox toolbar and now you're like a kid in a candy store. What's that? Look at that thing! What happens if I press this? I don't know about you, but for me the best way to learn without feeling like I'm wasting time is to start working on what I want while I'm learning. What do we want to do? That's the question, right? There are so many things out there, so many marvelous, wonderful, awesome information-filled— Hey! Are you falling asleep on me? Let's get started. Go ahead and pop open a new tab, or a new window if you wanna get crazy (I wouldn't blame you). Let's start how we always start out online: with a search. Now I know most of you had one thought in your head when I asked what you wanted to do. Don't lie! Come on, we were all thinking it "pictures of cats!" I know, I'm like a mind-reader. So to start off with our collection of cat pictures, let's find a list of good websites for cats and cat pictures. We can search for our furry friends directly from the Diigo toolbar if we like, or the same old boring way you always do it. That works too, I guess. 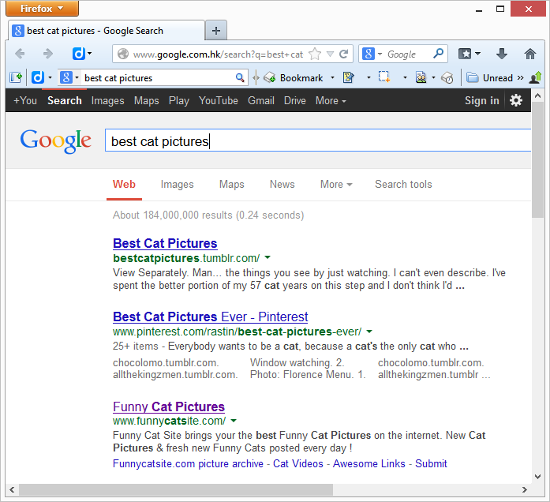 Let's try the very best keywords we can think of "best cat picture websites". That should be a winner! Right, so you've got a list of websites that probably have some great pictures, and you're cruising through the results, opening tabs for the interesting ones. Then, as you flip through the tabs you've opened, you find a page you know is golden. You want to bookmark it. I know you do. So what do you do? You bookmark it with Diigo! Okay, so you've probably bookmarked a page before. Right about now you're thinking to yourself, "Does this guy live under a rock? He thinks bookmarks are the coolest thing ever." Well you're right about one thing. I DO think bookmarks are the coolest, and I'll tell you why: because bookmarks are a visual representation of data on the web, and I like my data the same way I like my desk-- organized. I know what you're thinking now, "Uh... okay. I can organize the regular old-school bookmarks I've always used." True, but you know what you can't do with those relics? You can't store all of the thoughts you have in response to the things you see online, you can't isolate only the interesting parts of a web page, and, worst of all, you can't collect images of cute cats! So how do you bookmark a page with Diigo? Easy! 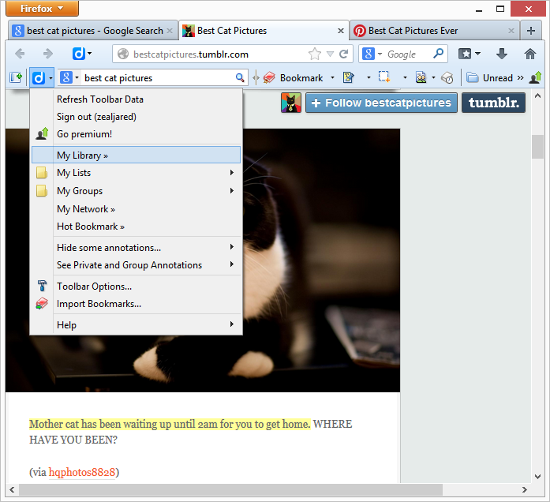 If you just want to bookmark the page with default settings, hit the book icon next to "Bookmark" on the toolbar. That's it. The bookmark is in your library. If the default settings aren't what you're looking for, click "Bookmark" next to the icon, and the save options will pop up. The "Title" text box lets you change the name of the bookmark as it appears in your library so you can easily recognize it by name. The "Description" field lets you describe the page or why you bookmarked it. "Tags" are labels that can be added to bookmarks to classify them. You can click on any of the words listed under "Recommended:" to add them to your bookmark, or enter your own tags in the text box, separated by spaces. Just click "Save" when you have the settings you want. Go ahead and bookmark all those great cat pages. You know you want to! Don't Just Collect Bookmarks, Collect Images Too! 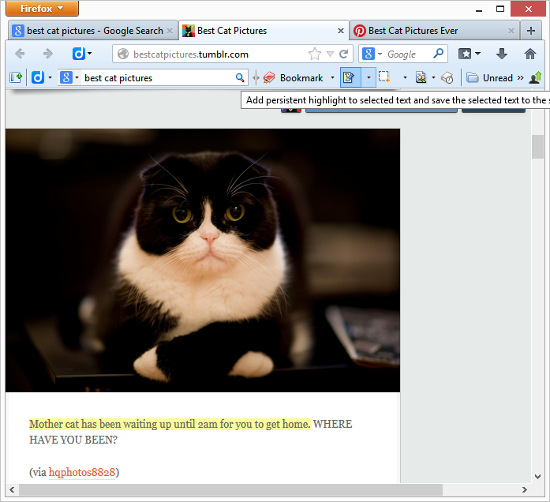 Now, undoubtedly, as you go through your cat picture pages you will find pictures that you have to keep. There's no avoiding that when it comes to cats. But if you save a picture of a cat to your computer, how will you see it when you are away from your computer? That simply won't do. Diigo can help there. 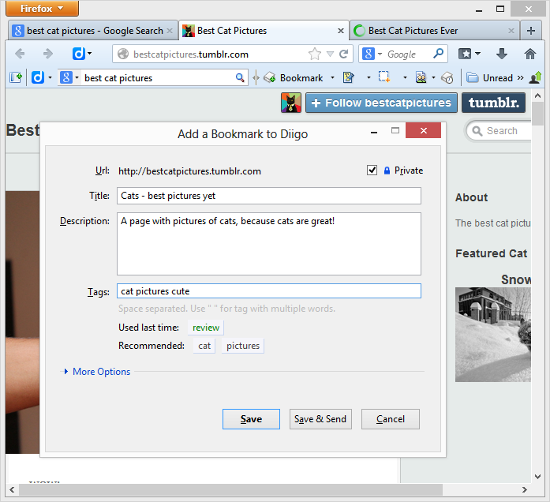 You can save an image directly to your Diigo library. Just right-click on any image and choose to save it to Diigo. Though most bookmarks are created in the heat of the moment, just for kicks, sometimes you bookmark a page because there is something you want to remember or refer to on that page. Somewhere on that massive page... Even when you have a link to that page, and you know what the page is about, you still have to open the page and search for whatever it was you wanted to remember. Not anymore! Diigo saves the day with "highlights". Highlights let you select the important snippets on a page and store them in your library with the page's bookmark. Let's try it. Just open a page, maybe one of your old-school bookmarks or one of your new cat bookmarks, and find the information on that page you actually care about. Select that important text. Got it? Okay, now put your helmet on, 'cause this might blow your mind! Click the highlight icon on the Diigo toolbar. It's the one with the "T" on a page with a yellow highlighter. You will notice that the selected text gets a yellow background. This means that the text has been saved in your library, and as long as you have the Diigo add-on the text will be highlighted on the page! How's that for easy? Now you've highlighted the text. It will appear in your library within the bookmark for the page it is on. Go to your library and you can see how it works. If you're not sure how to get to your library, just click the second icon on the toolbar (Diigo icon to the left of the search bar) and then select "My Library »". Look at your new bookmark at the top of the library list. Do you see the text you highlighted? If not, click on the little double down arrow to the right of the bookmark's title. There it is! Neat, right? What if it's not enough to just see a page, or see what someone else wrote on that page? It's not. It never is. But, luckily, there's a remedy for that too: "annotation". I know, sounds like that Latin phrase that AD stands for, but it just means making a note or leaving a comment. I want to make a note about a cat page I really like. I want to say why I like it, to remind myself, or maybe to share with other people. So how do I do it? As long as the page says somewhere on it exactly why I like it, I could just highlight it. But what if it doesn't? If it were a book, I'd just put a sticky note on it that says "This book is the business! ", but it's not a book. It's better than a book (because it has more pictures [of cats!]). No, it's a webpage, and I can't just stick a sticky note on my screen. What? I can put a sticky note on a web page? How? Oh, that's right! Diigo. Just right-click anywhere on the page and choose to "add a floating sticky note". Type up your note and choose "Post", then move the note anywhere on the page. You have to type a note first, before you move it where you want, otherwise there's nothing to move! Sorry, I just got back from throwing out all the books and sticky notes on my desk. Where were we? Sticky notes, yeah, those are good. What if I want to comment on something specific in the text of a web page though? What if I find a picture of a cat labeled as a tabby, but it's obviously a calico? Sacrilege! What then, huh? Shouldn't I write a response/clarification? Of course! And with Diigo, I can. You remember that sweet highlight stunt we just pulled? And that sticky note, right? Crazy! Well, here's a whole other level of awesome: you can add sticky notes to highlights! Combo! Now you probably have that highlight you made earlier laying around somewhere, right? While viewing a page with highlighted text, just mouse over the highlighted text and you get a little pop-up with a pencil on it. So, being the naturally curious soul that you are, you mouse over it, and what's that?! The very first option is to add a sticky note to the highlight! It's just like we practiced: click, type, "Post". Now we're really cooking, but we're still missing something. What if I want to respond to a picture? I could highlight some text including the image and write a sticky note, but images affect me visually, and I want to respond in kind. Diigo lets me do just that. I can scribble on a doodle, or doodle on a page. All I need to do is hit that "Capture" button on the toolbar to the right of the highlight button. Sounds intriguing, right? Do it! Now just click-and-drag to create an area to be captured. With that done, it's a snap to add visual symbols and text to the area, just choose text or a shape from the capture toolbar at the bottom of the capture area. Let's start with text. Choose the text icon, choose a color, click inside the capture area and type something. With the other tools it's equally simple: choose the tool, choose the color, click-and-drag to draw. If you make a mistake you have to redo the whole thing. NOT! That would be dumb. Because Diigo is not dumb, there is an undo button on the capture toolbar, so if you make a mistake, you can pretend it never happened. When you finish your masterpiece, just hit the save icon in the capture toolbar. Wait for it to upload to your library. When it's finished, it will show a link you can click to see it in your library. BOOM! It's in your library now. So we can save a page, highlight important things on that page, comment on the page, comment on highlighted text, and capture and draw on images to interact with the visual side of things. What are we missing? Here's a hypothetical: you're at work, or you're working on something. I know, pretty far-removed from reality, but stay with me. You're doing your work, and all of a sudden you see something you are actually interested in. What to do, what to do? You probably should keep working, but you really need to read about that new breed of cat. Well, Diigo can help with that too. Open the page and click "Read Later" on the Diigo toolbar (gray book with a clock icon). Quick! Before anyone sees. Now just click "OK" on the pop-up window and the page will close, safely saved as "unread" to your Diigo library. So now your hypothetical work-day is done. Where are all those super-cool things you didn't read? Easy! In the "Unread" folder on your toolbar. Click it and rejoice! Choose a bookmark and it will let you know that, now that you're reading it, it will no longer be "unread". Click OK and read to your heart's content! In addition to the folders on the Diigo toolbar, you can find and view bookarked pages by using the Diigo sidebar. Just click on the first icon in the toolbar. The sidebar opens and shows a list of your bookmarks. You can enter tags into the box to find the specific bookmark you're looking for. That's it! Enjoy the web with Diigo!